it's just a few days away from the new year and you know what that means: time to get a new journal for 2009. last year, we listed down our requirements for datebooks for office use and for personal use. and this time, starbucks is off the "for consideration" list because, even if it's nice, it's not spiral. hard to use on a daily basis. but that's just us. we've received some complimentary corporate agendas from different companies like thai airways, waterfront hotel, and dusit thani. 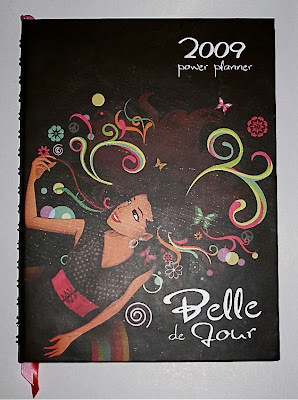 we also received this cute planner called "belle de jour." the belle de jour power planner started two years ago when its creator couldn't find the perfect planner to organize her life (hmmm, gives us an idea ;-) so she designed her own, to much success. 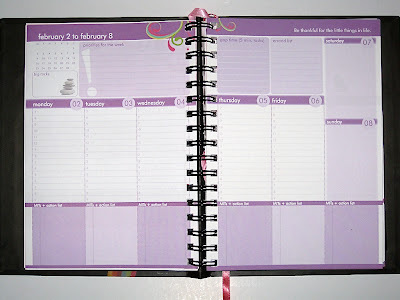 it's got tons of other stuff that you don't see in corporate planners (tracking your menstrual cycle, anyone??). it's also got tons of discount coupons. 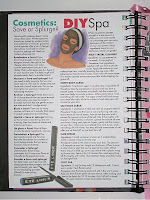 since it was created for the "pinay fashionista achiever," it's almost like having a mini-magazine with practical tips and advice on fashion, beauty, health, wellness, work, travel, and lots of inspirational chuva, even a "dream board" page (haay, we won't wanna look at that page in a year's time, baka ma-depress lang kami... haay, talk about being in a serious funk!). it's not easy being green?